In “The Growth of Amish and Plain Anabaptist Communities in Kentucky” (see latest issue of JAPAS), Joseph Donnemeyer and Corey Anderson examine the development of Amish and other Anabaptist communities in the Bluegrass State. They also touch on Amish settlement (or lack thereof) in the southern states. I pulled some interesting points from the article to share with you below. One thing to be aware of is that the authors use “Amish” in the text to apply to both horse-and-buggy and Beachy Amish/Amish-Mennonite groups. They give 53 as the total number of churches in these two categories, and if my math is correct 16 of those would be considered Amish-Mennonite. Kentucky has greater Amish-Mennonite diversity than any other state, with six subgroups, and is fourth behind Pennsylvania, Ohio, and Indiana for total number of members and churches. Leaving aside Amish-Mennonite churches, there are 37 horse-and-buggy Amish communities in Kentucky, including Old Order, New Order, and Swartzentruber Amish churches. Kentucky’s “most Amish” county is Hart County, containing parts of two settlements–Munfordville/Horse Cave, and Hardyville/Three Springs. About one in eleven Hart County residents is Amish. Compared to other largish-Amish population states, Amish came relatively late to Kentucky, first settling at Guthrie in 1958. Kentucky’s two biggest settlements are Munfordville/Horse Cave (13 church districts) and Hopkinsville/Pembroke (6 districts). Both were founded in 1989. There is little Amish settlement in the mountainous eastern counties of the state. Why aren’t there more Amish in the South? 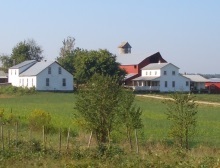 The authors describe Kentucky as being unusual as a southern state with a significant Amish population, while Amish settlement in the South has generally lagged. such as Minnesota and Nebraska. Kentucky is the exception, bordering large Amish populations in Ohio and Indiana. Missouri, which straddles regions, could also be considered Southern (at least in part). The Show Me State has a significant Amish population, even larger than Kentucky’s. Leaving Kentucky and Missouri aside, Donnemeyer and Anderson note that settlement attempts in the South since 1990 have failed at a much higher rate (nearly 1/3 failed) than any other region in North America. Besides horse-and-buggy Amish and Amish-Mennonites, there are 33 other plain Anabaptist congregations in the Bluegrass State. These include Old Order Mennonites (who also use the horse-and-buggy) and groups labeled as “Conservative Mennonite”. Non-Amish Plain Anabaptists in Kentucky include the Apostolic Christian Church, Church of God in Christ – Mennonite (Holdeman), and “Intentional Churches”. In contrast to the Amish, conservative Mennonites “who seek to establish a community witness in a non-Anabaptist area” have made their homes in the eastern Appalachia end of the state. Kentucky, along with Tennessee, “[have] become notorious for picking up experimental plain Anabaptist churches”, such as the Hoover Mennonites of Scottsville, KY, or the Christian Community churches, founded by former Ontario Amish bishop Elmo Stoll. Concerning the Old Order Amish, the article includes examples of how quickly settlements can grow and motivations for moving. There are also detailed charts at the end listing both the individual Kentucky Amish and Amish-Mennonite settlements, and population by county. It was good you pointed out that the authors included Amish Mennonites in the mix. I don’t think they should be included because neither they nor the horse and buggy churches recognize themselves as such. But to be fair, the one A-M congregation that explicitly claims the Amish label is located in Kentucky. And they are more Old Order minded than most New Orders. It was a little confusing, at least the chart at the end which includes both horse-and-buggy and other groups under the title “Amish Settlements in Kentucky”, until I figured that part out (I did skip around at first, heading straight for the data tables as I often do 🙂 ). On this site and elsewhere I generally save the term “Amish” for horse-and-buggy Amish people. I hope members of Beachy Amish and Amish-Mennonite churches don’t find that insulting especially if they self-identify as Amish. I do so in part because I think that is how the general public thinks of the Amish, and that is who this site is geared towards. I found the article interesting. I would be interested in an analysis in greater depth as to why Amish in the South have not flourished. I suppose Luthy’s writings would hold some clues, the authors here also refer to a 2010 paper which might have more on that. The Casey Amish church is the only A-M church I know that does not use the word ‘Mennonite’ (or some other more ‘progressive’ label) in the title of their congregation. Churches in their circle (a dozen or so?) might tend to lean in this direction also but I don’t know them well enough to say. Only visited a few times. But in broad terms the A-M people distinguish themselves from the Amish. A surprising portion have a low view of the Amish, or at least act surprised when they hear something good about the Amish. At the very least, the Amish function as a guardrail…so they remain somewhere between liberal Mennonite and the Amish. I think your use of the term is sensible. I think some A-M folks would be dismayed to be called Amish. I would surmise that the warmer climate is not favored by as many Amish folks. But I think land prices and population density have a lot to do with it. And as you noted, distance from other large communities contributes. Having taken a day trip through a handful of Amish communities in KY back in the fall, I find your piece here to be quite interesting. I still haven’t worked through all my pictures yet so I haven’t yet determined the cause of this, but there is just a ‘feel’ of something that is quite different in these areas, compared to MO or OH or PA, etc. Some of it is the practices of Amish themselves (e.g., this is the first place I’ve noticed Amish living in mobile homes); other aspects may just be different terrain, vegetation, or other non-Amish related differences. Erik, being from the South (SW AR), like you I would be curious about why the Amish haven’t flourished there. Lots of good farming going on in much of the South. I have to wonder if (historically, hopefully no so much now) there is too much of an us-vs-them mentality in the South. The blacks-vs.-whites racial divide was still strong when I was growing up in the ’60’s and ’70’s. “Us south’ners” vs. “them yankees” (i.e., anything that came from further north than a “southern” state) was still around and often a cause for suspicion. In some areas there has been a very strong (even if unspoken) sense of “if you ain’t native, you ain’t nothing,” that would have locals less welcoming of newcomers. And even where that wasn’t so strong, if someone wanted to come in and fit in, well, that’s all well and good. (But even after 20 yrs you’d possibly still be considered an outsider.) But if you want to come and and *not* fit in — well, friends, that’s a whole different story. There were some Mennonites not far up the road from the place I grew up, and while they were well respected for the volunteer help that they gave following small natural disasters (e.g., helping chicken farmers rebuild chicken houses after an ice storm), because they dressed and did things differently they were still *very* much the ‘them’ and no where near an ‘us.’ And if the Mennonites were viewed that way, then how much more so would the Amish be viewed with distance and the suspension that so often goes with that. LOL Loved your comments Don.. Im afraid there is probably more truth to it than not.. Im originally from Texas (next door) and that attitude definitely can be realistic.. Its too bad. Why so few Amish in the South? I don’t know, it’s a good question Don. I’m not sure the “us and them” mentality is so much a product of the South as it might be more prevalent in smaller towns and rural areas in general where outsiders are simply less common. As for racism, I may be biased since I grew up in the South but I’ve encountered more suspect racial attitudes in places where there isn’t such an ethnic mix and people aren’t as used to people of other races being around. For years one of the most heavily-visited posts on this site has been one about the Amish at Ethridge, TN, basically the largest southern settlement if you don’t count KY and MO. I take this in part as a sign of interest in the Amish from people in the South. The other thing to note about the South is that it has gotten quite an influx of people from other regions in recent years, so I think residents are probably welcoming enough since people seem to keep coming from northern states and other areas. I think “southern hospitality” is still a thing, just to bring up a positive stereotype. I think it could be, at least in part, something as simple as climate and comfort. The dawn of A/C has enabled a population boom in the South. The Amish are at a cultural disadvantage in that they can’t strip down for comfort as easily as English can nor can they dial the thermostat down to 70. You make a valid observation on the racial issue, but familiarity and even a superficial level of friendliness does not remove the us-vs-them feelings that have historically run very deep. And from experience (I grew up in a near 50-50 black-white population small town) I can tell that haven’t larger numbers of a given race (either way) may lessen the level that one group picks on the outnumbered minority, but the flip-side is that it emboldens those that would otherwise be silent to make a stand (whether that is a legitimate stand for something that is actually wrong, or a less-than-legitimate stand for an imagined offense — or somewhere in between). And yes, southern hospitality is still ‘a thing’ — and I hope that never changes (although I feel that it is weakening). But accepting of visiting outsiders has not meant the same as welcoming someone who opts for a different way of life with open arms to be an integrated part of the community. Accepting of diversity has become more of a thing in recent years, and that has likely softened up some of the us-them dividing lines from what they used to be. Don just circling back here. Yes, you’re right and I don’t really think there’s much or any connection since Amish aren’t using AC anyway, but it may be that more people notice that there are few Amish since, in part due to AC, it’s become a highly-populated region (arguably the highest-populated, depending how you draw your lines) adjacent to a region (the Midwest) with a lot of Amish. I don’t see the question posed as often with regards to lower-population New England or the Great Plains states which also have few Amish settlements despite being adjacent to areas with quite a few Amish. All us Southerners want to know where all y’all Amish are! And I don’t know if I buy those theories about the drawl and violence either, I really just shared the link for the info about AC and population growth. I guess the AC story is more an interesting bit of info than anything. I’m glad AC came along when it did. I live in an area near Spencer, TN. A year or so ago a group who called themselves horse and buggy Mennonites purchased 5,000 acres of land. They broke off from a group in KY because the KY group had become too worldly. The newspaper said there were to be 75 families, however it appears that there may only be 10-12. I pray their community is successful for I know they will be a blessing to our area. I think the Amish tend to live harder lives than most of us do…often working outside all day long. doing hard physical labor. In Texas where Im originally from, we know you only work hard outside from April or May until October before the sun goes high to roast you alive.. or you escape to air conditioning as much as possible.. Its a horrible life to have no AC there. I dont know how those poor folks down by Beeville are surviving.. I feel for them. People been farmin’ and dairy’n that area for years and years and years — no doubt since it was first settled in the pre-Civil War days. They didn’t have AC — they didn’t even have ‘lectricity. Yet they survived. So I’m not thinking that “it’s too hot to farm down there” is the real reason. Maybe too hot to want to farm — I could believe that. By the way, we were out in NW Arkansas this past August. Seemed like there was a lot of open country that would be a nice area for a horse and buggy settlement. Pretty area kind of sw of Eureka Springs toward War Eagle. Forest, what part of NC are you from? I was born in Goldsboro / Wayne Co. while my dad was stationed at Seymore Johnson (sp?) AFB. I’ve only been back to the area once that I was old enough to remember, but seemed like a nice area. And yes, I understand that moving into the deep south would be tougher than for those of us who never knew any different. My point was just that it wasn’t as impossible as it sounded like someone was saying that it is — and as evidenced by an Amish community way down in the very southern part of TX. If that area is survivable, then most other areas of the south will be a cake walk. Yes, there are some really nice places in the NW part of AR — really much of the north and west 1/3-1/2 of the state has lots of that kind of terrain. The area around Eureka / War Eagles is particular beautiful…, but I’m not sure it’s where the Amish would be interested and/or would be a good mix. In the past 10 or so years Eureka has taken on a special fondness by/for the gay community, and I just don’t see that and the Amish being particularly welcoming of each other. I would just like to mention that the Apostolic Christian Church no longer has a presence in Kentucky. We do have a congregation in Athens Al. and Atlanta Ga. This is directed to the previous comment from Matthew, What exactly is this Apostolic Christian Church? Is it like an Apostolic Pentecostal Church but more strict in ways? We have Church of God in Christ Mennonite Churches here in Mississippi, but I haven’t heard of this group before. Thankyou for any info you can provide. girl was marrying a guy from New York, and they were returning to live in New York State. I couldn’t help but wonder how the couple met, being so far apart. I was told there were other new families moving down from other states, but I haven’t met any of them yet. Thanks again for this wonderful site! Tim, I am sorry that I have not responded sooner. I missed this post until now. In case you have not learned by now the Apostolic Christian Church of America is not Pentecostal. We are a denomination that is made up of people from Amish and Mennonite background. We are an Anabaptist Church. For more information just go to our web site.